YMV manufactures 2-14 meter rail span, 7-60 meter outreach 2-80 T capacity range Lattice Boom shipyard cranes. Hydraulic or electric drive alternatives are available. Single or double boom cranes are choosen accoring to project requirements. According to customer request, angle and load control properties can be added. Electric cable drum or power are fed by its own YMV generator as optional. 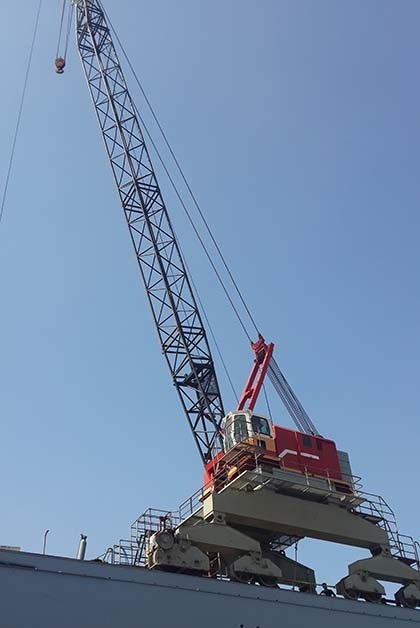 YMV Lattice Boom Cranes are manufactured for Port, Drydock and Shipyard Applications.